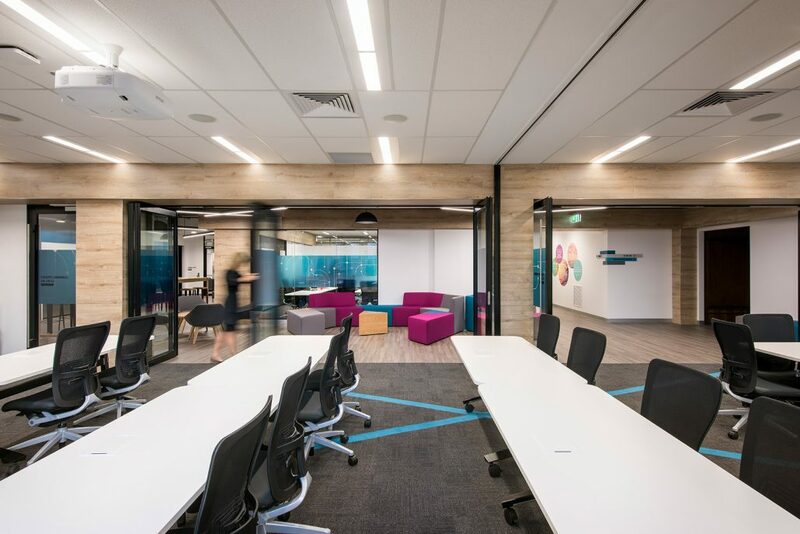 Hodgkison has recently completed the conversion of existing standard office accommodation into a flexible studio space to facilitate various types of training and learning for a large corporate organisation in the Adelaide CBD. Five separable studio spaces are provided which can be configured into various combinations of spaces through the use of sliding and bi-folding glazed operable panels. The central connecting spaces provide a breakout hub and waiting spaces along with creating smaller spaces to support collaboration and informal meeting opportunities. The use of textural finishes, exposed ceilings and services, combined with existing heritage window features created a contemporary space with an industrial warehouse edge.